The first thing you have to decide when shopping for a new clothes dryer is electric or gas. Electric dryers cost a little bit less, but require a 240 volt outlet and will normally cost more to operate. Gas dryers require a gas hookup and a standard 120 volt outlet. For this article we are going to focus on the best electric dryers. One other important factor is how much space you have which will determine what type of model you can get. 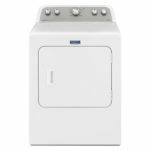 Full size dryers are normally up to 29 inches wide, but there are stackable options which can stack directly onto the washing machine, and compact varieties that are 24 inches or less. The main feature that almost all decent dryers have is a moisture sensor. This will detect when the laundry is dry and shut down the machine. This saves your fabrics by not subjecting them to additional heat and will save you money by using less energy. Be aware though that cheaper models may not have a moisture sensor and instead just have a thermostat. Some other features you should take into consideration are obviously drying performance, capacity, noise level, energy efficiency, special features like steam cycles, and the warranty. We looked at dozens of models and in addition to all the features we mentioned we also factored in price and other user/consumer ratings to come up with our list of the top 10 best dryers which we review below. We also have a spec comparison chart at the bottom of this article. Shoppers should also remember that large appliances are on sale very often at different stores, so shop around and only buy when they are on sale to save lots of money. (In fact the prices listed below were the cheapest sales prices we found at the time of publication). 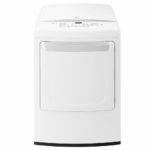 We chose the LG DLEX9000V as the best electric dryer which can be found for about $1198 on sale. This 9 cubic foot capacity unit has lots of extra features you won’t find on cheaper models. It starts with the door which is contoured, angled, and elevated to make loading and unloading easier. Modes include TurboSteam to quickly reduce wrinkles, Sensor Dry system which monitors moisture levels and automatically changes the drying time, and SteamSanitary cycle which lets you use steam to sanitize items that are marked as non-washable like kid’s toys or throw pillows. We could find no major flaws with the LG DLEX9000V, although it does take up a lot of space and it is not stackable. Overall if you are willing to pay up for excellent drying performance with lots of features than the LG DLEX9000V is a good choice for you. The matching washing machine is the LG WM9000HVA. The most expensive dryer on our list is the $1299 Maytag MEDB955FW, which also has the largest capacity on this list at 9.2 cubic feet. This machine has universally positive user reviews and ratings at every store we checked. In addition to being reliably made, the Maytag MEDB955FW has an advanced moisture sensor, a PowerDry cycle which dries faster, a Steam refresh cycle, and a Sanitize cycle. The only real negative for the MEDB955FW is the expensive price tag, but you might be able to find it on sale for cheaper at different times of the year. It also is not stackable. The matching washing machine is the Maytag MVWB965HW. 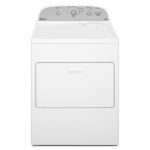 The $998 LG DLEX7700VE is a very versatile machine and is our pick for best electric dryer under $1000. The largest consumer magazine gave the DLEX7700VE its highest score. It has a unique feature in that the door opens hamper-style to load wet clothes, but it can also swing to the side for easy unloading. At 9.0 cu. ft. capacity it can handle large loads as well. Some other features of the LG DLEX7700VE include TurboSteam which can reduce wrinkles in just 10 minutes, sensor dry system, and NFC technology that lets you download new cycles from your smartphone and diagnose any problems with the machine. The matching washing machine is the LG WT7700HVA. It is not stackable. The LG DLE7100W ranks highly thanks to the incredible value at its price of just $628. The drying performance is excellent – on par with more expensive models. This well made machine also has 7.3 cu. ft. of capacity, but saves you money by not having any special features like a steam option. It has LG’s Sensor Dry system to auto adjust drying time and has 8 different cycles to choose from. The LG DLE7100W is not stackable. The matching washing machine is the LG WT7100CW. Another outstanding dryer with a decent price is the $648 Whirlpool WED75HEFW. It offers a good balance of build quality and brand reputation for the cost. The WED75HEFW has front controls and is our highest rated electric dryer that is stackable. The Whirlpool WED75HEFW has all the most important features including moisture sensor and temperature controls, but does not have any steam function. Overall this unit should provide years of trouble-free drying. The matching washing machine is the Whirlpool WFW75HEFW. We had big expectations for the $998 Electrolux EFLS627UTT since its matching washing machine was one of our top rated models, but it left is wanting a bit more. 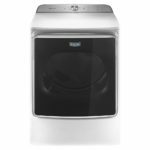 While still performing quite well, its overall performance just didn’t quite reach up to some of the other highly rated dryers on this list and it simply took longer to dry clothes. On the upside the Electrolux EFLS627UTT looks beautiful, has a large 8 cubic feet of capacity, and is stackable. It also has a lot of special cycles including an Instant Refresh cycle which uses steam to quickly remove wrinkles and refresh fabrics in just 10 minutes. The matching washing machine is the Electrolux EFLS627UTT. The best electric dryer under $500 is the $498 LG DLE1501W. Despite the low price, the drying performance was on par with Electrolux. LG redesigned the traditional dryer when coming up with the LG DLE1501W and put the control panel right on the front. It also features 8 drying programs, sensor dry system, and NFC technology to download new cycles and diagnose problems. 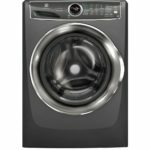 Overall if you are searching for a cheap dryer that won’t let you down, then you should absolutely consider the LG DLE1501W. It is not stackable. The matching washing machine is the LG WT1501CW. 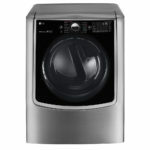 One of the best selling dryers at the Home Depot, the Samsung DVE45N5300W can be found on sale for about $598. The drying performance is good, but it is a bit louder than some other more expensive models. Despite a very affordable price, the Samsung DVE45N5300W is not lacking in features. It has sensor dry, 10 drying cycles, 4 temperature settings, multi-steam technology, and is Wi-Fi enabled so you can troubleshoot right from your smartphone. 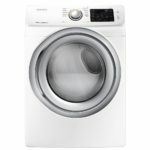 Overall if you want a cheap dryer that also has a steam function then the Samsung DVE45N5300W is for you. The matching washing machine is the Samsung WF45N5300AW. These units are stackable. 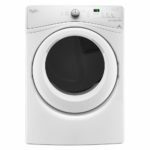 The folks over at thewirecutter.com picked the $548 Maytag MEDX655DW as their best electric dryer. The thinking is that most dryers all work roughly the same, so it is better to get a model that is simple, well-built, has a good reputation for reliability. This machine has a capacity of 7 cu. ft. and a moisture sensor which will get your loads dried evenly no matter the size of the load. The Maytag MGDX655DW doesn’t have any extras like Wi-Fi or a steam cycle which saves you some money. Overall this model is a good choice for anyone looking for a quality, long-lasting budget dryer. The matching washing machine is the Maytag MVWX655DW. 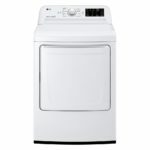 If you are looking for a dryer that costs less than $500, then another option for you is the $498 Whirlpool WED5000DW. This 7 cu. ft. capacity model is a very basic, well-built dryer with good drying performance. You won’t find any fancy features on the Whirlpool WED5000DW, just a basic sensor drying system, 13 drying cycles, and 5 temperature settings. 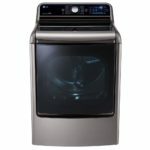 Overall the Whirlpool WED5000DW is a good choice for anyone looking for a cheap dryer who doesn’t need steam functions or any other advanced features. However, it won’t wow you and it is a bit louder than some other more expensive models. The matching washing machine is the Whirlpool WTW5000DW. It is not stackable.